Live life on the Edge - IT's A JOURNEY . . .
Its more than 2 years, we live so close to Smokey Mountains, yet it took a business hangout to get us to visit this amazing place. Its amazing how priorities can help you structure your life better versus running around and missing the major things while chasing the everyday mundane fun. Think of Smokey’s and you think of water rafting. Everytime there’s an element of “UNKNOWN”, its adventurous – how’s the water current going to be, what if the raft turns over, will we be able to paddle through the current, all this makes a perfect recipe for fun & adventure. And the calming thought was – Many have done it AND we have a GUIDE. So lets jump into the raft. Before jumping in, the guides gives us 3 INSTRUCTIONS. In my mind, I felt I don’t need those instructions. We’ll be fine, but still just heard what he had to say. You get into the water and moment your raft starts floating, you know you are in the unknown terrain and this fun ride could very well be a lasting experience. And for me it sure was. It was fun to sit in the front and lead, love that feeling when you face everything first, you have no cover, its just more thrilling. The raft floats, we laugh, we giggle but first strong current and the water sucked me into the stream. And that’s when you know, if I panic, I lose it, if I stay calm, there are enough options. Isn’t that a good lesson for life, whether in water or lively everyday life? Sure, I stayed calm and then those 3 INSTRUCTIONS of the guide race through my mind; Thank God, I heard them though I didn’t want to – “Stay Clam, Don’t stand up, Flow with the water & the nearest raft will rescue you”. Most times we don’t want to take instructions, but it always come handy. Think of instructions as someone’s experience and your ego will never come in the way to accept it. It was just 10 seconds and my guide pulled me back up into the raft. 10 Seconds of not knowing what next could happen is like years of walking in dark room, not knowing what hits you next. Moment I was back in the raft, I had this calming feeling, I am back in my territory, I’m safe. And I felt that much more confident, once you face the danger & survive, you feel more confident to face the journey, knowing that you know what worst could happen and how to live through it. It doesn’t stop there, we have another hours or more to go in this rafting journey. We put our paddles in the water, we stroke, we move forward, sometimes we just flow with the water. And while everything seems calm, next big current and for God knows what reason, I am back in the water out of my raft. And moment I fell back in water, I knew this is not going to be 10 seconds with the water current being rapid and I could see my raft float far ahead. Stay Calm, Don’t stand up in flowing water, the nearest raft will rescue you, were the only thoughts I had. AND I don’t see no raft near me. I wanted to grab hold of a rock and sit on it, but water kept me floating away and forward. Do I have to finish the whole journey floating? Will I be rescued, what if I hit a rock hard, will my body be bruised with water current washing me with it. So many thoughts racing, but there’s always this overriding thought – “I’ll be fine”. And sure I was, water flow got little calmer and a raft picked me up and before I know I was traded back to my raft. Good to be back with my mates, and one of them being my wife. I cant leave her and go, maybe I tested every danger to know how secure she is. Back on the raft, 2 dips in water, I know I can face anything now. I had this over bearing confidence, I can go in for the third time. And then you wonder what others might think, I could hear few laughs, some laughed too hard, but who cares, I’ve visited a territory that many may never visit and they might never know the complete deal of rafting. Rest of the ride was smooth, no more falling off the raft, no more facing the water alone. Kept thinking, what’s it with me, to be pulled into water everytime. Maybe water God’s really like me. It was fun anyways, never easy to fumble and stand up, but everytime you stand up, you are better you. Though I am strong, I know I am weak, I am human. And finally out of water, out of raft, we rush to see the pictures and I look at my pictures. There it was. I was sitting too much on the edge of the raft. Maybe that’s who I am, like to live life on the edge. I like to sit on the edge of my chair while I learn from a master, life is worth living on the edge, that’s what makes you cutting edge? Maybe! I am happy I was sitting on the edge of the raft, experienced what many may never. 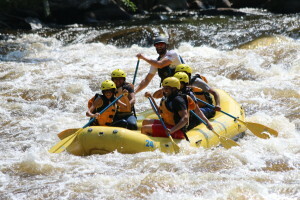 And happy I’m alive, maybe next time living on edge is good but not while rafting — maybe!